With most big media companies retrenching around the world, Dow Jones (NYSE: NWS) has said it plans to expand. The latest evidence is a new Japanese-language site that is in the works for next year. 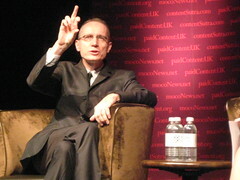 No word from the company’s editor-in-chief Robert Thomson on whether it will be a Japanese WSJ.com. But the former Times of London editor told the Reuters media summit in New York yesterday (via Reuters.com) about the plans for more international expansion and how advertisers are starting to come out of the woodwork after scaling back spending during the downturn. — East and West expansion: It’s hardly DJ’s biggest revenue stream, but its Japanese foreign-exchange information business is its fastest-growing and a Japanese-language site is slated for H109, though the company will not be making any acquisitions there. This comes on the back of some serious hiring and investment in Europe, where a revamped WSJ.com/Europe is looking to take on FT.com under the watch of local newspaper publisher and new WSJ Europe MD Andrew Langhoff. It’s not all investment, of course: there will be cuts at the company’s Enterprise Media Group, though Thomson says it’s not a case of “slash and burn”. — David adds: A DJ rep said the company isn’t disclosing specifics about the planned “boost” the company to give the Journal in Chicago and LA, saying only that, “We are looking to make WSJ.com more relevant regionally.” Again, the company isn’t talking about the details just yet.